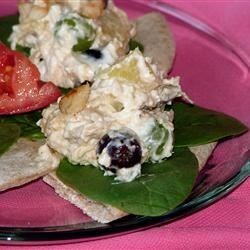 "This delicious, fruity chicken salad is a change from the standard. It's easy to double the recipe for a larger group." In a medium bowl, beat cream cheese until fluffy. Mix in salad dressing and 2 tablespoons reserved pineapple juice. Stir in the pineapple tidbits, chicken, almonds, and grapes until evenly coated. Chill until serving. Brought it to a potluck and it wasn't very popular... didn't like the canned chicken very much - I changed out the almonds for Macadamia nuts since it was Hawaiian. Good chicken salad. Used walnuts instead of almonds. Would be good with mandarin oranges, too. What a great chicken salad! I used low fat cream cheese to keep down the calories and the flavor was fabulous!